Hey there, thanks for stopping by! My name is Summer and I'm not a "dancer", I hate the gym, and I can't touch my toes to save my life. You don't have to be a dancer, we are not a gym, and we have yoga to help you touch those toes. Point is, if you don't enjoy a typical "workout" or you can't seem to make it to the gym after work, then we're your spot. Our Happy Hour classes will have you actually looking forward to your exercise routine! We make the workout fun and unforgettable, in a good way. All you have to do is show up. So, break away from your mundane fitness routine, cancel that gym membership you pay for but never use, and come party with us! I'll see you on the dance floor! Stephanie loved dancing and taking classes at Drip Drop so much she decided to start teaching! Steph started dancing at three and hasn't stopped moving since. She loves motivating others and having fun while doing it, so Drip Drop Fitness was the perfect fit! She's a PR professional, avid volunteer in the Tallahassee community, and a District Manager with Arbonne International. She believes fitness and a healthy lifestyle is one decision at a time and loves meeting people where they are on their health journey. Gwen has lived in Tallahassee her whole life and is currently a Freshman at TCC. She plans to further her passion for fitness by studying exercise physiology in college. Gwen has been dancing her whole life including Irish dance, jazz, hip hop, contemporary, lyrical and ballet. She has been a part of multiple dance teams, along with taking multiple classes at studios such as Artistry Dance Alliance. Hip Hop is her favorite dance style which she incorporates into her Drip Drop Fitness workouts with sassy, energetic moves, and the newest songs! Rachel is from Orlando, FL and was a competitive dancer growing up, performing musical theatre, jazz, tap, hip hop, lyrical, and more at nationals across the country. Rachel found her love for group fitness when she discovered POP Pilates! She decided to purse a certification to be able to TEACH POP Pilates. Rachel also is an ACE Certified Group Fitness Instructor. When Rachel isn’t teaching you can find her with her cats, at work as a Computer Support Technician, or planning her upcoming wedding!! Rachel’s bubbly personality shines through in her choreography, making for a high-energy and fun class! Amanda is a recent graduate of Florida State University, is from Jacksonville Beach, and is a licensed behavioral therapist in Tallahassee. She puts mental health first and brings a playful feel to our yoga class. She attended a teacher training program for a year and has her 200 hour Registered Yoga Teacher certification. Amanda's creative twist to classical yoga is sure to get you hooked! Kylie is from Jacksonville, Florida and graduated from Florida State University in 2015. Her love for dance and performing led her to join the FSU Flying High Circus during her time at FSU. It also cultivated a love for all things fitness. She is a certified barre and pilates instructor, and teaches music at a local preschool. Kylie was also a member of the Dance Tallahassee performance company for two years, and she loves to dance whenever given a chance to! Kylie teaches our BOOST class as well as Pop Pilates. AND, drum roll… is our wonderful Assistant Manager! Any membership questions? Song requests? Feedback? Talk to her at your next visit to the studio!! 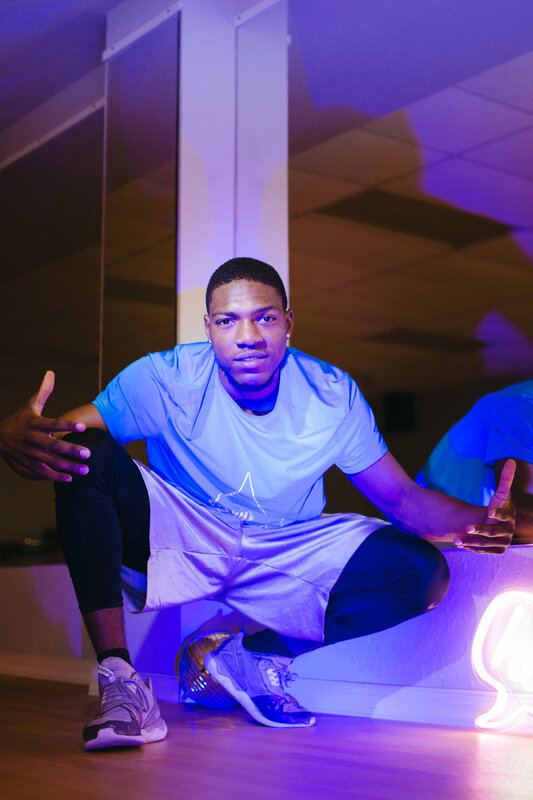 Brandon Stubbs is a high energy dancer from Miami Florida, currently studying Physical Therapy at FAMU with goals to one day be a Sports Medicine Physician. Brandon is also an active member of the infamous “Strikers Dance Troupe”, Miami’s “Ain’t No Chill Entertainment”, and is a member of the legendary FAMU “Marching 100” playing the Trombone! Brandon enjoys Hip-Hop, throwback dances, and the unique “Drill and Ride” Miami style of dance. Brandon always has a smile on his face and will makes the most of his 60 min. Happy Hour Class! Bailey Davis is from Coral Springs Florida and is an industrial and manufacturing engineering major at Florida State University. She has always led an active lifestyle whether it was on the soccer field, in the gym, or dancing. Teaching dance fitness classes when she lived in South Florida has inspired her style and spirit. Her passion for dance and fitness led her to Drip Drop Fitness. Her energy is contagious and will surely get you moving and breaking a sweat!! Dana is a Fort Lauderdale native, Senior at Florida State University studying Accounting, and is so excited to be part of the Drip Drop family! Dana danced competitively for 10 years at her home studio, Dancing Plus, in South Florida. She was captain of her high school dance team, and spent her summers training at ballet schools that include the Joffrey Ballet in NYC and the Next Generation Ballet in Tampa. In college, Dana was in Dance Tallahassee’s performance company for two years, and also became a member of Seminole Dance Force. She serves as the current treasurer of the nationally ranked competitive sports club team. Dana loves everything about fitness, and also teaches Barre! She hopes to inspire others to live a healthy and positive lifestyle through her uplifting and fun-filled classes! Mark Nicolas is from Miami, FL and attends Florida A&M University and holds the prestigious title of the FAMU King Of Orange and Green! You may have seen him in action with Strikers Dance Troupe where he serves as the assistant rehearsal director or with the FSU hype team during basketball season. Mark brings a ton of energy by incorporating hip-hop, pop, and some island vibes into his Drip Drop Fitness classes! His music selection and moves make for an incredible workout... some say his class is the most challenging! See for yourself ! Introducing ALY, our newest addition to the team! Aly has been teaching yoga since 2015, enjoys teaching gentle flow, intro flow, and meditation. Aly encourages yogis of various backgrounds to feel confident and comfortable in their bodies and in their practice. Jenala currently attends Florida State University. She’s majoring in International Affairs with a certification in U.S. Intelligence Studies. She’s been dancing for 14 years, and has taken classes from many choreographers across the nation. She is on Seminole Dance Force, which is FSU’s competitive sports club dance team. Jenala is also an instructor for the Universal Dance Association and Artistry Dance Alliance. She has tons of energy and can’t wait to bring it into her Happy Hour classes. You’ll most likely catch her with a smile because she believes there’s never a reason not to be happy. She can’t wait to share her love for Fitness and dance with the community at Drip Drop.